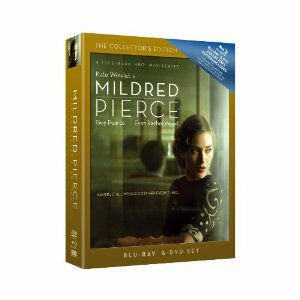 The original Mildred Pierce from the 40s is thought to be a blend of film noir and the mother melodrama. At that time this is how the James M. Cain novel was turned into a relevant and excellent film, but Todd Haynes approaches the adaptation differently for his 2011 five-part HBO miniseries adaptation of the Cain classic. There is a lot less noir and a lot more melodrama, but it is done with some of the most capable actors. All seem expertly cast, and though I couldn’t at first imagine Kate Winslet in the title role, she embodies it in a way that is her own. Set in Depression-era Los Angeles, the nearly six hour film follows the emotional highs and lows of one independent woman named Mildred Pierce (Winslet). After her husband leaves her for another woman, Mildred is forced to get a job as a waitress to feed her two children. Her eldest daughter Veda has high expectations, and Mildred keeps her job in service a secret to save her the shame. This relationship between mother and serpentine daughter is at the center of the film, though other men come into their lives as well. One in particular (played by guy Pearce) is there with Mildred when she becomes a success and rises above poverty into the upper class. To speak more of the details in the plot would not necessarily ruin the film, because it is more of a marvel to watch simply for the performances and the production elements. The costumes and all of the details in the scenes are worth admiring in high definition. This is also a performances piece and there are many people worth complimenting, with Winslet being the obvious first. Veda is played by a surprisingly exposed Evan Rachel Wood in the final two episodes, and she plays it pitch perfect. The Collector’s Edition Blu-ray and DVD Box Set is absolutely stunning. The box cover itself is stylish and classy, made from the best materials. I found myself touching and admiring the case as I watched this lengthy mini-series. As carefully and intentionally as all of the details within the series are laid out before our eyes, they are also applied in the making of this collector’s edition set of the five-part character piece.